Do you ever wonder what goes on in the Capitol? How does a bill become law? How do our elected officials, many of whom are on opposite sides of the political spectrum, work together for the best interests of the public? When budgets are tight, how do they prioritize and fund much-needed programs for education, medical care, housing, public safety and so much more? How do they deal with the tough stuff and begin the "conversation" without falling victim to polarization and political drama? Representative Mitch Greenlick takes us inside the Capitol and gives us a front-row seat to the process of law-making. 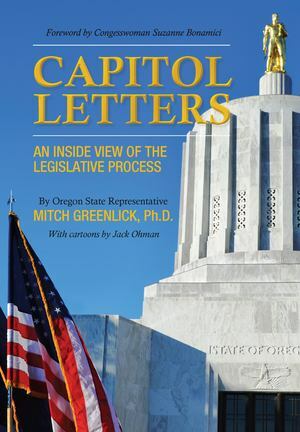 Most legislators send out some kind of newsletter to their constituents, but Greenlick's MitchMessages are unique in that he writes them himself; they are his own very personal account of legislative sessions as a participant/observer. Capitol Letters is a compilation of those messages, nuanced by his academic background, but written to be accessible to the ordinary citizen.